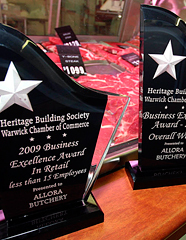 Allora Butchery | About Us : An Independent Local Butcher – Fresh Meat Specialist. Allora Butchery is steeped in history dating back to the 1800’s. According to the local historical society, Allora Butchery is the oldest established business in the small Queensland town of Allora located between Warwick and Toowoomba on the Darling Downs and it was opened circa 1888. 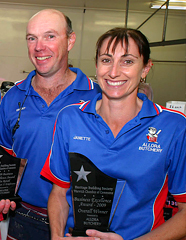 It continues to be a family owned and operated business and current owners Grant and Janette Lollback have operated the business since March 2003. In that time the business has grown from a one man operation to six people on staff. In September 2008 we totally revamped our butcher shop and undertook renovations that doubled the size of our premises and included the installation of a new eleven metre long display counter. The daring move to expand our traditional butcher shop to include a kitchen and employ a cook to create the TIMESAVER PRODUCT RANGE, stems from our belief that consumer trends are changing as just about everyone works in some capacity often leaving them "time-poor." An ever increasing number of people are now seeking meals which require less preparation and minimum effort to cook in the home. With this exciting range of products, speed and ease is achieved without compromise to the traditional values associated with meat – that it is wholesome, nutritious and tasty. One of our defining features is that we are proud to promote all our beef as HGP (Hormone Growth Promotant) Free and locally produced. Each week we go on farm and select only the best quality beef cattle that are then sent straight to slaughter therefore eliminating the stress associated with buying cattle from the saleyards. In doing this we are supporting our local producers and ensuring that the quality of our product is always of the highest level possible. We are able to provide customers with more specific information such as the breed of cattle and what they were fed on. Modified on 24/08/2015 8:36:24 AM.